An old Indiana State sales tax law is now being enforced. 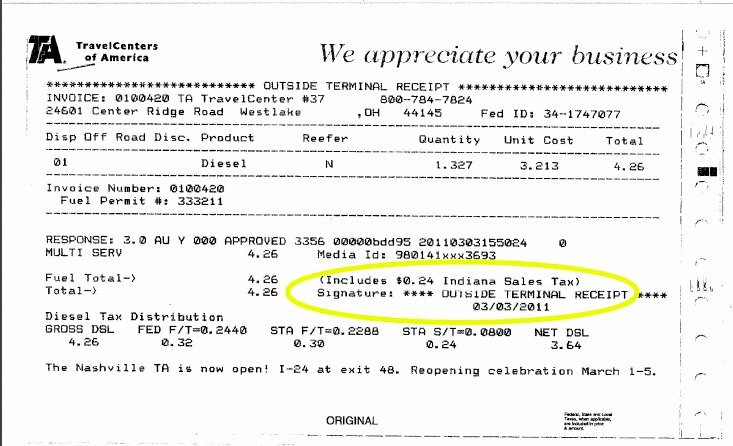 In the past, the State of Indiana required TA and Petro to post signs at the diesel pump stating, “Trucks Only” in order to exempt diesel transactions from the 7% sales tax. The State of Indiana has fined an Indiana TA truck stop for not requiring exemption certificates from all its exempt customers. The fine is in excess of $200,000 per location. This fine may impact your fuel pricing and discounts in Indiana. How do I know if my trucking company is exempt from the Indiana Sales Tax? Unfortunately, Apex or TA and Petro cannot tell you whether or not you are exempt for sales tax. Generally, if you are hauling freight for others for hire, you may be exempt. But, we cannot provide tax advice or tell you for certain whether you qualify as exempt under the State of Indiana’s laws. If you choose to pay the fuel tax and later find out you are exempt, you can file for a refund from the State of Indiana. Click here for the refund form and instructions on how to file for a refund. If I complete a tax exemption form, will I receive discounts on fuel? TA and Petro does not include the 7% Indiana sales tax in the pump price. It is an additional tax that is added to the transaction total. 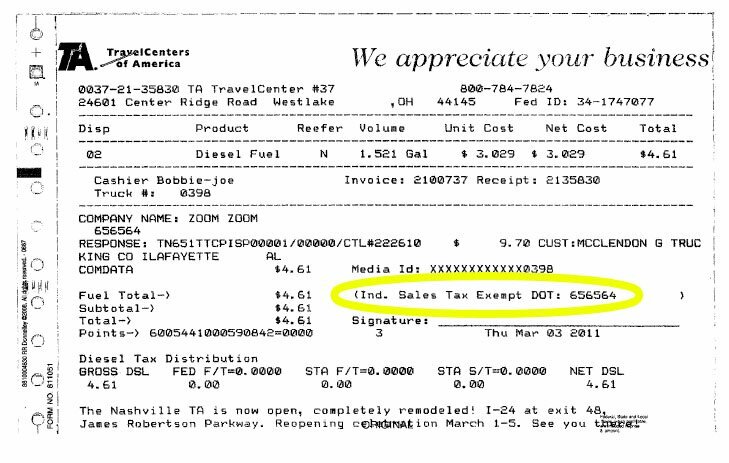 Submitting a completed Indiana sales tax exemption certificate will allow you to purchase diesel fuel without the additional 7% sales tax added on. If you do not have an exemption certificate on file with TA and Petro or will not complete a single-transaction exemption at the fuel desk, TA and Petro must charge the additional 7% sales tax. The additional sales tax is equivalent to approximately 20+ cents per gallon. What’s going to happen at the pump? There are several possible scenarios depending on the trucking company tax exemption status. After the driver swipes the fuel card, they will be prompted to enter the company’s DOT#. If the driver enters a DOT# for a trucking company that has a tax exemption certificate on file with TA and Petro, the transaction will process exempt from sales tax. Below is an example of what the receipt will look like. If the driver enters a company’s DOT# that TA and Petro does not have on file or enters an incorrect DOT, an MC number, or any other truck number, the driver will be prompted to come to the fuel desk to verify information before proceeding. The cashier will enter a temporary exemption # (valid for 1 fueling only), the receipt will print, and the driver will sign the receipt. After the driver swipes the fuel card and enter the company’s DOT#, the driver will be prompted to go to the fuel desk. If your company chooses not to submit a sales tax exemption form, your receipt will reflect this. An example is below. You may print the form and enter the information needed or open the document and type in the appropriate information. 1. The first 2 lines are your company’s name & address. 2. Skip the following line and provide your State Tax ID# (or Federal ID# if you do not have a State ID#) on line #4. 1. You are applying for a blanket purchase exemption. 2. You are purchasing diesel. 1. Check the 4th box from the top. 2. Provide your company’s DOT# in the blank space. 1. Sign and print your name (not the company name) and provide the date. 2. Print your name and title. Finally, either email or fax (817-665-2291) this document back to Apex.